When CHIN3927 attempted to remove a USB external drive, Windows' wouldn't provide the Safe to Remove message. The Answer Line forum offered help. When Windows tells you that you can't safely remove a flash drive or other external storage media, it asks you to "Close any programs or windows that might be using the device, and then try again." 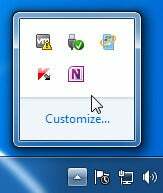 notification area (what used to be called the systray) to make sure that you've properly closed any program or data file that you launched from the external drive. If that doesn't work, you might try closing programs that were reading files off the drive. I've opened a Word file off a flash drive, closed the file, and then discovered that I had to close Word entirely to remove the drive. Closing all Windows Explorer windows can sometimes help. If none of these tricks work, take the long route: Shut down your PC, remove the drive, and start it up again. This always works. If this problem occurs frequently, try downloading and installing Unlocker. This free program (with requests for donations) comes in 32- and 64-bit versions. When you install it, watch out for requests to install additional software (such as the Bing Bar). Unlocker is intended to help you delete files that Windows doesn't want you to delete, but it also helps for ejecting drives. If Windows won't tell you that it's safe to remove a drive, right-click the drive in Windows Explorer and select Unlocker. When the program comes up, it will list all running programs and processes that are holding on to that drive. Unlocker has Kill Process or Unlock buttons, and they're fine if you want to delete a file. However, for this purpose, I recommend noting what program is holding onto the drive, and then closing it the normal way.